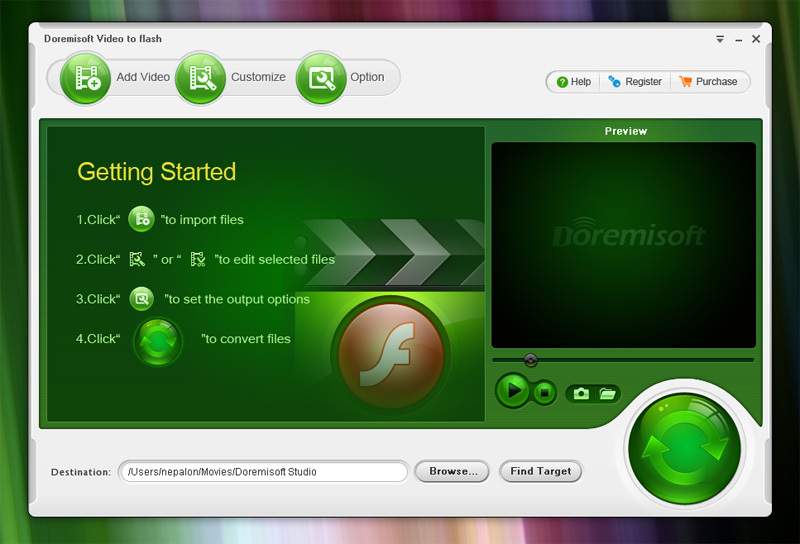 Doremisoft Video to Flash Converter allows you to edit your video before convert video to flash, like video clipping, cropping, merging, adding artistic effects(Gray, Old Film, Emboss), adjusting video brightness, saturation and contrast, sliding to make a playlist. The highpoint lies in its customize features that you can take audio & video settings, select a customize flash player with skinning control bar, add special effect, attach preloader for your output flash video.What's more, Video to Flash converter empowers you to add text/image to video, embed hyperlink in video and create a head and tail at the beginning and end of the flash files. Qweas is providing links to Doremisoft Video to Flash Converter 1.0.1 as a courtesy, and makes no representations regarding Doremisoft Video to Flash Converter or any other applications or any information related thereto. Any questions, complaints or claims regarding this application Doremisoft Video to Flash Converter 1.0.1 must be directed to the appropriate software vendor. You may click the publisher link of Doremisoft Video to Flash Converter on the top of this page to get more details about the vendor.